This post was written by BTTM team member Alicia Glassmeyer. The city of Denver is known for many things, including it’s natural beauty and world class museums and delicious breakfast restaurants. But the Mile High City also has another claim to fame… Christmas lights! The story revolves around the child of electrician D. D. Sturgeon, who was very ill at Christmas time in 1914. Sturgeon had the “bright” idea of hanging paint dipped light bulbs on a tree outside the window so his sick child could see and enjoy some of the holiday cheer he was missing from his bed. This led to an outdoor lighting contest in Denver a few years later, and as Denver began illuminating its City Hall each year at Christmas it was dubbed the “Christmas Capitol of the World” in the 1920s. Today you can still enjoy a piece of this history with a holiday trip to Denver to see the lights! Below you’ll find our recommendations for where to see the best holiday lights in Denver. In a place where cold weather and snow is a frequent occurrence during the winter months, a trip to the botanic gardens might seem like a crazy idea. Fortunately, the Denver Botanic Gardens has a fantastic light display throughout December that makes for a fun evening out with family or friends no matter what the weather! It’s actually considered one of the best things to do in Denver in December. Even the kids will delight in the lights because there are tunnels of colorful lights with changing patterns, a walkway of “light sabers” through some tall grasses, and glowing orbs of light reflecting on the water gardens. And, in case you aren’t convinced yet, there are hot beverages and mini donuts on sale at concessions that will warm you right up. The “Blossoms of Light” show is a path that winds visitors through the gardens and ends with a lovely interactive dancing light show with music. Not even all Denverites know there is a second Denver Botanic Gardens facility, but we’re letting you in on the secret! Just southwest of Denver in Littleton, you will find Chatfield Farms. In the summer, this is a lovely botanic garden and working farm and a fun pumpkin patch in the fall. In the winter, it transforms to the “Trail of Lights” a fun twist on the Christmas light viewing tradition with the addition of antique tractors decorated with lights, a red barn, candy cane striped silo, and a huge cottonwood tree with thousands of lights. When we visited there was a fun activity for kids to make reindeer out of candy canes, a hot beverage station, and a nice warming hut with a fun photo backdrop complete with holiday costume items. This historic Denver train station has recently been remodeled and turned into a hotel and gathering place complete with restaurant, bar, and an ice cream shop that serves boozy milkshakes! Inside they have decorated with lovely wreaths and a giant Christmas tree. Outside, the building is always lit up beautifully, but at Christmas time it is extra special with red and green lighting. A historic piece of the Denver skyline, this clock tower used to be part of a department store. The store is long gone, and part of the tower is now an events venue, but it lights up the sky every night with a variety of colors for different seasons or events. Much like Union Station, the red and green lights at Christmas time are the best. This is conveniently located on the 16th Street Mall and right behind it is the ice skating rink that pops up for the holiday season. This is the showstopper and part of Denver’s holiday lighting history. Every year after Thanksgiving, there is a Grand Illumination event when the lights downtown are officially turned on. The display here is simply magical, the whole building glows and festive music rings from the bell tower. There are displays on the steps in front of the building and the lights change color throughout the evening. This year the tower goes from a beautiful purple color to the standard red and green holiday colors. There are still even more places to take in some beautiful displays of light in and around Denver. Zoo lights at the Denver Zoo is always great, and what’s more fun than walking around a zoo at night sipping spiked hot chocolate and viewing fun animal themed lights? If you’re visiting Denver in early December, the city hosts the annual Denver Parade of Lights which is great fun to watch rolling along the downtown Denver streets. Also, every year the Denver Post puts out a map of local light displays in the metro area that helps you customize a route to see beautifully decorated homes. So grab a jacket (and maybe some boots if there’s snow) and head out to see the bright holiday lights in one of our favorite cities! I had no idea it was the Christmas capital of the world- sounds like a great place to celebrate the holidays in the USA! Wow. Your photos are so bright and vivid. The town is so colourful and lovely and you have really captured the magic. I am glad I got to see it all through your eyes without having to be there. I am not a fan of snowy winters, and I think white is also part of the Denver magic. I had no idea that the city did all this, let alone holding a title. Very cool. Thank you! Fun fact, the night the downtown photos were shot it was actually near 50 degrees, there’s not always snow on the ground all winter long in Denver! 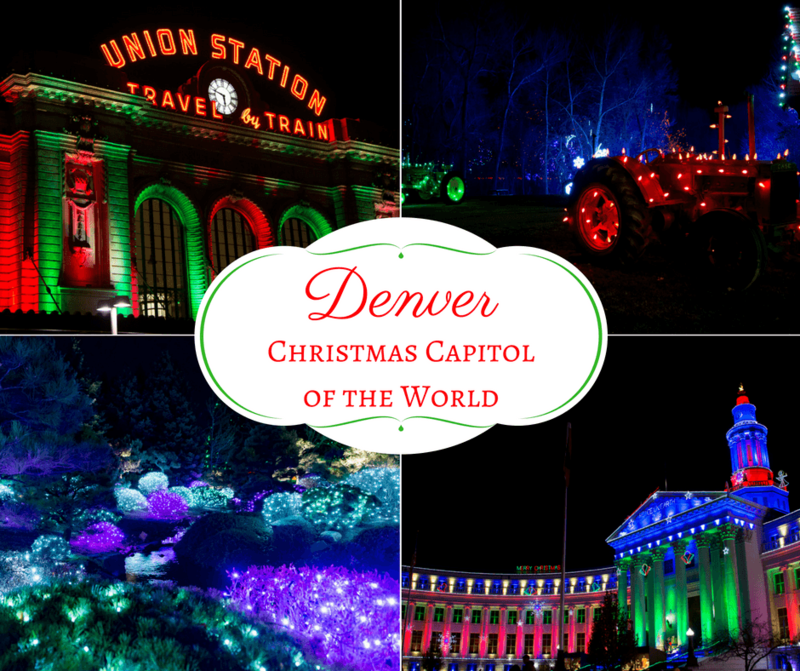 I had no idea that Denver is known as the Christmas Capitol of the World! Learn something new this Christmas day! I would love to visit the city over the holiday season and take in the light displays. We don’t really prioritize lights here in Australia over Christmas – some places do but they’re nothing on the scale of the States. Will have to get to Denver one year soon! It’s a great place to spend the holidays. Let Buddy know if you make it to Denver and maybe I can help you see the sights! I had no idea that Denver was the Christmas Capital of the world. Judging from the beautiful photos it deserves it. The lights are so nice and the city is so beautifully decorated. I would love to visit next year! Thanks! There are so many reasons to visit Denver in the winter, the lights are definitely a bonus! Denver truly looks like the Christmas capital of the world! I’ve never seen such an amazing display of lights. My favourite is the farmer. That farm holds a special place in my heart and I loved the farmer lights too! It’s something different from the normal holiday lights we’re used to seeing and so much fun! How fascinating thatDenver is the Christmas capital of the world!! Really interesting to read how the colored lights came into existence…thanks D. D. Sturgeon!! Your pictures are amazing and the lights at Chatfield Farms are awesome. Would love to visit Denver at Christmas time now…thanks for the history and Happy Holidays!! Thank you! It is a really cool piece of Denver history, you should definitely see it in person someday! So much about Denver! I am so glad to know about this city which I am not sure if I will be able to visit. So touching to know that a father had this great idea of hanging colorful lights for his sick child. Amazing lighting done up there. I didn’t know Denver was the Christmas capital of the world. Anyone who knows me knows I’m a Grinch lol. However, I can’t help but get excited when I see pretty lights. They really know how to deck out their architecture with beautiful Christmas colours. Stunning. Great post. Holiday lights are one of my favorite parts of Christmas. It looks like Denver goes all out. I’d love to see this for myself one day. Love the story of the colored lights too. Happy holidays indeed! I knew the story but didn’t know it was from Denver! Awesome. I think the botanical gardens looks particularly awesome. Just more reasons for me to want to visit Denver. I’ll have to add going during Christmas to the list now.